With over 240 breathtaking photographs and footage from the landmark BBC series, The Hunt captures the dramatic encounters of predator and prey in an entirely new light. Featuring the extraordinary strategies of a huge range of predators, from cheetahs and African wild dogs to killer whales and polar bears, these images and stories will revolutionise what you thought you knew about life in the wild. Whether through speed, stamina or complex subterfuge, each creatureâ€™s strategy is honed to its environment â€“ and remarkable adaptations mean that the hunted often can, and do, outwit their hunters. Itâ€™s a life-or-death duel where each animalâ€™s skills are stretched to the very limit. The final chapter of the book goes behind the scenes to recount the adventures of the production teams as they themselves stalk their quarry â€“ and are sometimes stalked â€“ to discover never-before-seen species and previously undocumented behaviours. 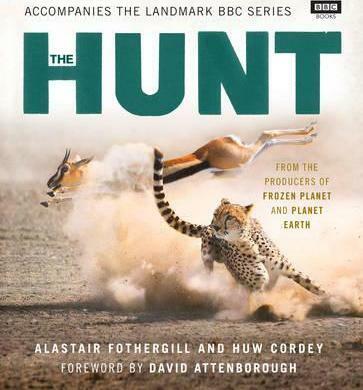 From the producers of Frozen Planet and Planet Earth, The Hunt reveals in astonishing detail the most surprising and significant events in the natural world.